In recent years standing desks, which encourages users to activate their core muscles as well as their leg muscles have become increasingly popular as office workers and entrepreneurs have discovered that sitting in a traditional chair, for prolonged periods of time, can be detrimental to your health. If you’re looking for a high quality, standing desk, that boasts a multitude of features, you may be interested in finding out about the Varidesk Pro Plus Standing Desk, which is one of the highest rated standing desks currently available. If you ever feel the need to sit down at work, you’ll be able to lower your standing desk in seconds as it boasts a spring assisted lift which can raise and lower your desk in seconds. So if you get tired of standing or want to sit down and take a business call, you’ll have the freedom and flexibility to do so. On the top tier, you’ll be able to fit a large computer monitor, whilst still having space to place an extra laptop and your smart phone. 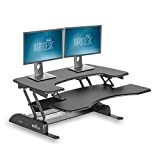 If you favor a dual monitor set up, you’ll also love the Varidesk Pro Plus Standing Desk, as it can comfortably accommodate two large, flat screen monitors. On the bottom tier of your work station, you’ll have plenty of space to house a keyboard, a mouse and any work documents you may require on an average business day. As a bonus, you’ll even find that you have extra space underneath your standing desk, which you can use to place books, files or stationary. Not only is it incredibly stylish but it’s also incredibly sturdy. As an example the 36 inch model, can hold up to 18.5 kg, so if you have a large computer monitor, it’s well worth purchasing this particular standing desk as many of the other standing desks on the market are constructed from sub par materials and can’t hold as much weight as the Varidesk Pro Plus Standing Desk. If you have recently brought a work desk, you may be pleased to read that the Varidesk Pro Plus Standing Desk has been designed to sit directly on top of a normal work desk. So if you’re particularly fond of your current desk or have a desk which has sentimental value, you’ll be able to use it in conjunction with your new standing desk. This will also allow you to make your current desk more ergonomic. So, if you’re convinced that you should invest in a standing desk and have been shopping around for a high quality standing desk, you simply can’t go wrong ordering your very own Varidesk Pro Plus Standing Desk. I have read a lot about standing desk spaces and as a sufferer of back pain it is something I will eventually invest in. Sat behind a desk for 10 hours a day is probably the worst thing to do for a bad back. You can even try just making sure you get up every hour and walk around a bit. If that seems to help your back you might want to go full blown into buying a standing desk.